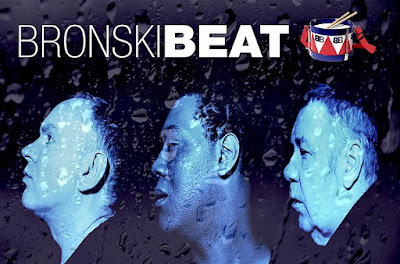 Discussions Magazine Music Blog: BRONSKI BEAT: An EXCLUSIVE Q&A with Steve Bronski! BRONSKI BEAT: An EXCLUSIVE Q&A with Steve Bronski! It has been 33 years since Bronski Beat arrived on the music scene with their remarkably emotional debut single “Smalltown Boy.” Jimmy Somerville’s soaring falsetto was quite a wonder to behold but the music performed by Steve Bronski and Larry Steinbachek was equally enthralling. Equally enchanting, the band’s debut album THE AGE OF CONSENT was Synthpop at it’s finest. Inspired by classic Disco and the Electronic Music scene that was sweeping the UK, the trio blended their influences into a wondrous brew. Add in their thought-provoking lyrics that focused on gay-related issues and you had a band that not only made you dance but also made you think. Surprisingly, in 1985, at the height of the band’s popularity, Somerville abruptly quit, leaving Bronski and Steinbachek to carry on without him. The following year, the band returned with new vocalist John Foster and released the Pop-errific sophomore album TRUTHDARE DOUBLEDARE. Although “Hit That Perfect Beat” and “C’mon! C’mon!” were hits, the album didn’t fare as well as their debut and the band left their label (London Records). Foster left the fold and Bronski and Steinbachek’s continued to work together throughout the rest of the ‘80s and into the ‘90s. They released their third album, RAINBOW NATION, with new vocalist Jonathan Hellyer and additional musical assistance from Ian Donaldson. However, the band quietly split in 1995 shortly after that album’s release. Now, 22 years after that third album, Bronski Beat has returned to the record shops with THE AGE OF REASON, a two CD set that brings the band’s past bang up to date! On this album, the band has re-worked and re-recorded their classic debut album, THE AGE OF CONSENT, recorded three new songs – “Stars,” “I’ll Be Gone” and the beautiful “A Flower For Dandara” - and added a second disc of remixes of those three new recordings. On THE AGE OF REASON, Steve Bronski and Ian Donaldson are joined by new vocalist Stephen Granville for this exhilarating journey through their past, which adds a modern twist to the band’s classic sound. Granville has a very different voice to Somerville and doesn’t try to emulate him. Instead, he takes several different detours, vocally, and adds fresh energy to these songs that many of us know so well. In essence, Bronski and Co. have remodeled their ‘80s classic for a new generation. Alongside the familiar songs, the three new tracks prove that Bronski Beat remain a vital force in modern Electronic and Dance music. STEPHEN SPAZ SCHNEE: THE AGE OF REASON has just been released. How are you feeling about the way the album turned out and the reaction to it so far? STEVE BRONSKI: Really happy with the album - was quite unexpected. Started off with me getting in touch with Ian Donaldson last year. Ian had been a part of Bronski Beat since the early ‘90s and we hadn’t seen each other for a while. Initially, we were just making backing tracks for live shows and it ended up becoming THE AGE OF REASON. SPAZ: Instead of just going into the studio to re-record the album, you essentially re-imagined it for a new generation. Was it enjoyable to go back and revisit these songs? Combining “No More War” with “Ain’t Necessarily So” is the perfect example of you taking chances with this new release. STEVE: It all just seemed to fall into place when myself and Ian got back together. We decided to refresh the old tracks, bring them up to date without losing the magic that made them so special. As I said before, they were really made for live shows so some are updated and some completely re-imagined. It was also nice to include songs that haven’t been done live since the ‘80s. The “No More War” with “Ain’t Necessarily So” medley was just one of those moments that happen now and again in the studio that seemed to work well so we went with it! SPAZ: The new recordings are different but don’t stray too far from the originals. Did you tread carefully in order not to upset your fanbase or did you do it all on instinct and stick with what felt right to YOU? STEVE: As backing tracks, we didn’t want to stray too far as they needed to be recognizable for the fans but still sound fresh. I think we managed to strike the balance well and the feedback so far has been great. SPAZ: In a sense, the songs are given new life with these new arrangements. Are you hoping that they’ll be discovered by a new audience who may not be familiar with the originals? STEVE: It was strange in a sense that working on the old songs we quickly came to realize that many, if not all the songs, are as relevant today as they were back in 1984. Songs like “Why?” and “No More War” I think will still speak to a lot of people just as they did when first released. SPAZ: The album features new vocalist Stephen Granville. Was he someone that you’ve worked with before or did you go through the audition process in order to find the right voice and personality that would fit your vision? STEVE: Ian actually introduced me to Stephen. After Bronski Beat took a break in the ‘90s Ian went on to DJ as Sordid Soundz and through working in the clubs, he worked with Stephen over the years when Stephen was doing Pas. When we got back together, we needed to find a vocalist, Ian let me hear some tracks he had recorded with Stephen and I immediately fell in love with his voice - perfect for the new Bronski Beat sound! SPAZ: You’ve worked with Ian Donaldson in the past. Was it nice to return to the studio again with him? STEVE: It was great. We had toured and recorded as Bronski Beat from the early ‘90s and always got on well. We hadn’t seen each other for years but as soon as we met up it just fell into place and it was a really easy process. We know how each other works and with the history we have and the shared experiences of the past it was nice to catch up again. Ian was the person I knew would bring what was needed for Bronski Beat in 2017. SPAZ: Stephen doesn’t seem to be doing a Somerville impersonation, which really benefits this project – he seems to inject himself into the songs. Did you give him free reign in the studio or did he work within the framework of your musical vision? STEVE: It was important for us to let Stephen put his stamp on the songs. As I said, I fell in love with his voice when I heard it so to try to get him to emulate Jimmy would not have worked. Being slightly younger than myself and Ian, he knew the obvious tracks like “Smalltown Boy” and “Why?” but the rest of the album was new to him. We gave him a copy of THE AGE OF CONSENT and let him go through it for a couple of weeks. Being the professional that he is, it didn’t take long for him to work out how he wanted to do the songs so that they worked for him. SPAZ: There are new songs added to the project as well. What made you decide on re-recording THE AGE OF CONSENT album instead of creating an entirely new album? STEVE: To be honest, the idea was to record new tracks as demos and the old tracks would be just for gigs but after recording the three new tracks we decided to demo all the old songs with Stephen just to see how they would sound. Barney from Cherry Red Records heard the tracks and decided he wanted to put it out as a package. 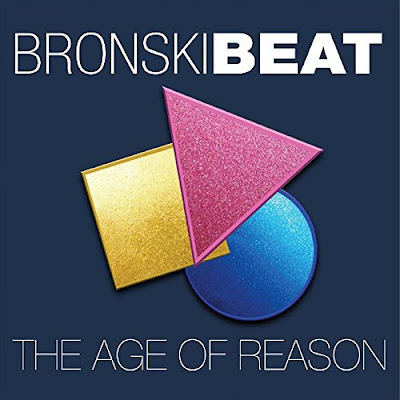 SPAZ: Judging by the new songs, Bronski Beat is still as relevant as ever. Were these songs created for this album or had you been working on them for some time? STEVE: “Stars” was the first song we recorded with Stephen - we thought it would be a fun cover. Myself and Ian loved the original Sylvester version and it seemed perfect for Stephen’s voice. “A Flower For Dandara” was a last minute addition for the album. Ian had sent myself and Stephen a link to an online article about the brutal killing of a Brazilian Trans woman named Dandara Dos Santos. We were all horrified and realized this was not a one-off - it was happening a lot. We had to write a song about it and when the record company heard, it they decided it had to be on the album. It was also a great opportunity to get Rose McDowall (Strawberry Switchblade) involved. As a long-term ally of Bronski Beat, we knew we wanted to work with her on something. She loved the track and we thought she would be perfect for it! It was also an unconscious return for Bronski Beat to speak out on issues that affected our community just as we had in the past. SPAZ: What is next for Bronski Beat? STEVE: “A Flower For Dandara” gets released 21st July as a remix package with THE AGE OF REASON coming out a week later. We are hoping to be out touring later in the year and will soon start writing and recording new material for the next album. We are also in demand as a remixing team - expect to see some Bronski Beat remixes of other artists in the near future. It’s looking like a busy year! SPAZ: What music are you currently listening to?